When I set out to create a savoury keto scone recipe, I wanted to make sure I delivered a savoury scone that was delicious (of course) but a really great consistency. I consider these little keto scone bad boys to be a recipe we could all enjoy keto or not. They are soooo good straight up or toasted is also a whole other level! 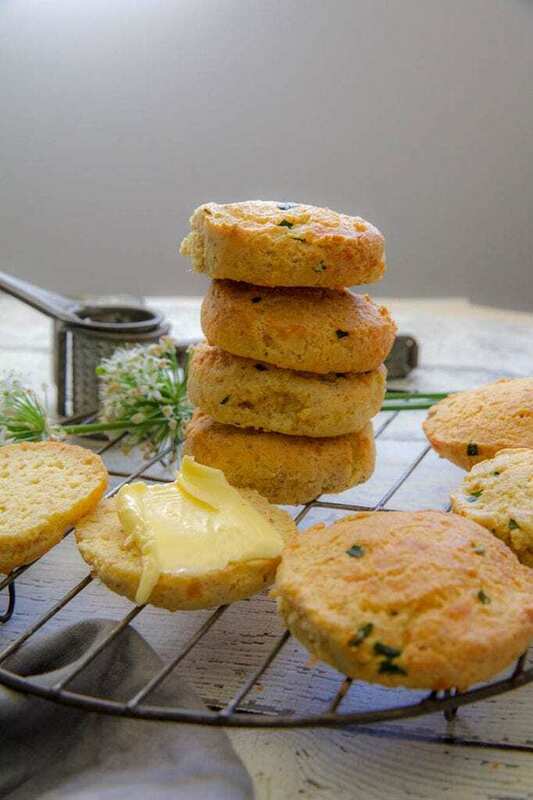 Let’s just say the testers had a great time testing these savoury keto scones. Straight up we had some testers creating variations and making bulk batches from the get-go. I will be doing the variations of these keto scones in the new Lunch Time Keto cookbook as well as the 4 Weeks Keto Meal Plan. I am always just tempted to share some of the great recipes with everyone freely so no one misses out. This is one of the recipes I know that a lot of you are going to just love. Before you ask me whey protein isolate is pretty integral to making this recipe as perfect as it is. 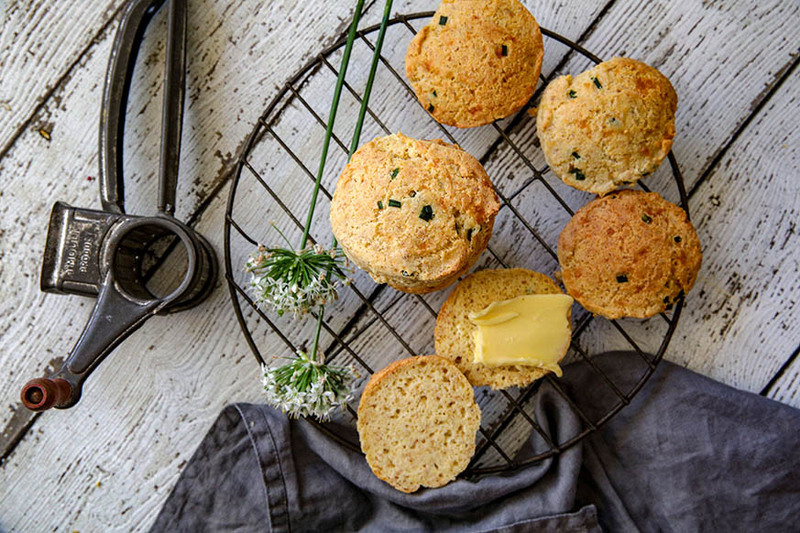 It gives lightness to this savoury scone and baked goods, as well the slightly crisp outer texture. If you choose to omit the scone will be more dense and heavy and not at all the same. I am just making these as easy as possible to make whether you make with a Thermomix®, stand mixer or food processor. These are just a quick mix of all ingredients and push into a mould and bake. It is totally up to you to add your own flavours and savoury combinations. I use fresh garlic chives from my garden that are very strong with garlic “essence” if you are using normal chives feel free to add a tsp of garlic powder or garlic granules. Baking time is a little higher than normal flour scones, but don’t affect the taste or texture. For dietary substitutions please check the recipe notes within the recipe card. For our US followers yes these are just the same as what you refer to as a biscuit. These would go fabulous with any gravy, soup or meal. WANT MORE RECIPE LIKE THIS? Want to keep up with all the Mad Creations shenanigans? Join us on Facebook or Instagram, and make sure you are on our subscribers list for new recipes, new releases and early bird offers. These savoury keto scones have a beautifully light crispy outer edge, fluffy centre, they nicely rise in the oven and bloody delicious! A very simple recipe with so many variations you will be making them all the time. Preheat the oven to 180℃. Line a baking tray with baking paper. Combine flax meal, almond meal, whey protein isolate, xanthan, baking powder, and salt into a stand mixer with dough hook attached..
Add rest of ingredients and mix until just combined. Follow instructions below from Step 5 onwards. Preheat the oven to 175℃. Line a baking tray with baking paper. Mill flax seeds 10 seconds/speed 10. Add rest of ingredients, except chives. Mix 40 seconds/speed 4. Place lightly oiled scone cutter mould on prepared tray and spoon in 50 g tablespoons of batter (I measure) into mould. With an oiled index finger gently tap the mix into shape and remove the mould and repeat with all the batter. Makes 12 scones. Place tray into refrigerator for 15 minutes before baking. This helps give a higher rise and less spread of the scone. Bake for 20-22 minutes or until lightly golden and cooked through. 1. Refrigerate scones an airtight container for up to 5 days. 2. If freezing, pre-split scones for easy thawing and/or toasting. 3. These are suitable to eat on their own as a bun, or a great accompaniment to soup. 4. The variation of flavours is endless, please check main blog post for other tasty recipe ideas. 5. For a nut-free version use a combination 50/50 pepita/sunflower seed meal. 6. For dairy-free, replace butter with ghee or coconut oil, cheese for nut cheese, and sour cream for coconut yoghurt. Replace whey protein with pea protein isolate. 7. For egg-free, replace eggs with 160 g whipped Aquafaba or 1/2 cup "unsqueezed" zucchini. Can you make these without the whey isolate? I do not recommend making these without it as you will end up with a totally different end result. WPI makes keto baked goods light, flakey and good. You can just add more almond meal but they will not be the same. Made these and they did not disappoint. So delicious. Absolutely Amazing, I have made them twice now and i’m going to make another batch tonight but giant ones for burger night! These scones are so good. I added some cooked bacon bits to mine and used normal chives and a teaspoon of garlic powder. I will be making these again. So nice to have a savoury scone. I definitely recommend making these tasty little scones any time as they are quick and easy to make. 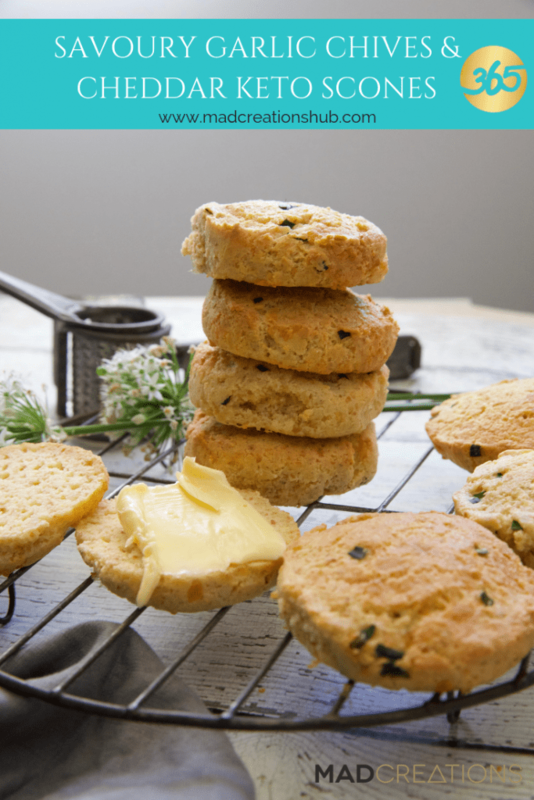 To say these savoury scones are great is an understatement! I made them and topped them with some cream cheese smoked salmon and a sprig of dill. Yum! If you were entertaining make them smaller to pass around while you are having drinks. I also toasted one and had peanut butter on top. Again yum. It’s now a favourite. I’m going to have one tomorrow for breakfast with bacon and eggs. Love the idea, Lovely & delicious , Thanks for sharing…. Hi Megan – made these but used organic hemp protein powder as no WPI in cupboard and although turned out darker in colour due to hemp powder I am happy. 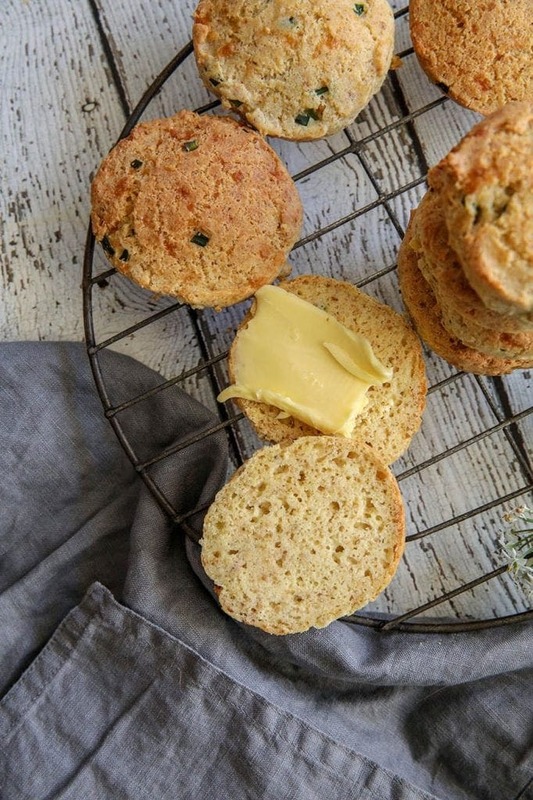 Wouldn’t mind making just as a plain scone – would I need to substitute the cheese or could I just leave out?